GREEN TORNADO team members cheer on the autonomous robots that they created for the First Lego League challenge. Students at Turning Point School took first place in a Nov. 11 citywide robotics competition, called First Lego League. Beating 24 other teams at the qualifying tournament, Turning Point’s first-place team will advance to the league’s regional championship later this month. First Lego League is an international competition that invites students to research a real-world problem and then develop a solution. The students also must design, build and program a robot to address the problem they have been tasked with, then complete various challenges on a table-top playing field. The theme for this year’s challenge was hydro dynamics, with students asked to learn all about water and solutions to improve the process of finding, transporting, using or disposing of the natural resource. Turning Point had two teams at the competition. The “Gold Tornadoes” team, that consisted of middle school students, and the “Green Tornadoes” team — that earned the Champions Award (first place overall) — that was composed of upper elementary students. In the judging room, the Green Tornadoes scored high in robot design, project design and core values. Turning Point head of school Dr. Laura Konigsberg said the Green team excelled in all of the necessary tasks, but that it was the team’s “poise and confidence” that earned them the top spot. 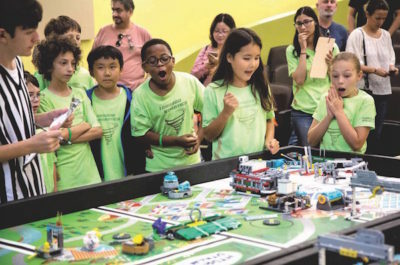 “They won this competition because, in the absence of adult teachers and coaches, they were able to shine by demonstrating their robot and explaining their thinking and development process clearly and articulately. “We are so proud of our innovators and of the learning that they spearheaded,” said Konigsberg.